トップ > Robot > Simultaneous Localization and Mapping in Dynamic Outdoor Environments. Simultaneous Localization and Mapping in Dynamic Outdoor Environments. I will explain about my research. The Simultaneous Localization and Mapping, also known as SLAM, is a highly active research area in robotics. The SLAM is that a moving robot estimates simultaneously a map of surrounding environments and its position and attitude. Figure 1 shows the process of SLAM. If the SLAM technique could be implemented perfectly, mobile robots could explore in unknown environments where globally accurate position data (e.g. GPS) is not available, for example, undersea, underground and other planets. Today, SLAM is starting to be employed in unmanned aerial vehicles, autonomous underwater vehicles, planetary rovers and newly emerging domestic robots. Figure 1: Conceptual diagram of SLAM. 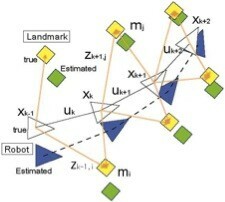 The mobile robot estimates landmarks and its position simultaneously. The map estimation leverages the position information and the position estimation leverages the map information. SLAM in dynamic outdoor environments is very difficult for two reasons. One reason is that spurious landmarks enter the map. This is caused by dynamic objects (e.g. pedestrians, cars and bikes) and objects which have complicated shapes (e.g. plants, trees and artificial objects). As a result, the SLAM will have serious error. Another reason is that the number of landmarks in the map increases because of the spurious landmarks. According to the results, computational cost increases and doing SLAM on the fly will become difficult. Our objective is to solve these problems and make it possible to do SLAM in dynamic outdoor environments. In order to achieve this objective, stable feature detection by a laser range finder and efficient data management are introduced. The stable feature detection is used to select static and characteristic landmarks, and it is possible to estimate the position of each landmark accurately in the dynamic environments. The data management is introduced in order to decrease computational time and localization errors of SLAM. Unscented Sampling is a sampling technique based on unscented transformation for estimating landmark and robot's position accurately. The Unscented transformation is a statistical technique to estimate a nonlinear system. We adopt the unscented sampling for SLAM in dynamic outdoor environments. Animation 1 is a SLAM simulator. We prove the effectiveness of our SLAM with the simulator. The simulation result proved that the computing time and the maximum position error of SLAM decreases by 80% compared with typical landmark estimation method. Figure 2 shows experimental result in a real dynamic outdoor environment. The result shows that our SLAM is very accurate in the dynamic outdoor environment. 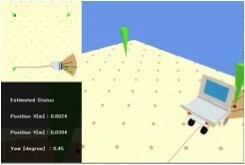 Animation 1: SLAM simulation; the simulator is made on MATLAB and XNA. FastSLAM2.0 is used on the simulator. The simulator can use virtual landmarks which is set by users and actual sensor data (e.g. LRF, Stereo camera). Figure 2: SLAM result in the dynamic outdoor environment. The experiment field was Tsukuba Central Park. 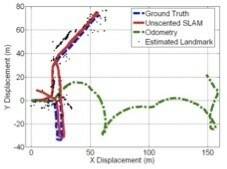 The green line, the red line, the blue line and the black points indicate the trajectory of odometry, SLAM trajectory, Grand truth, and estimated landmarks respectively. The result shows that our SLAM is very accurate in the dynamic outdoor environments.